Over all the IRoam eboard Segway isn’t only a fancy thing to look at it can contribute with hours of fun for both kids and adults. We had a great time testing this hoverboard and we love it as do many of their previous customers who already recommend the IRoam eboard. 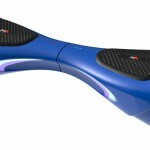 Design, It has one of the coolest designs I have seen in a eboard/hoverboard. Speed, 10 mph is really good and it really felt much faster. Climb, It had no problem climbing and 23 degree hill with 180 lbs on it. Key Lock, Turn your device on/off and lock it with a remote control. Distance, Even though 10 miles is the average I think they could have over delivered a bit more on the distance. 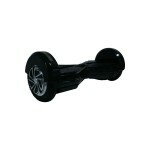 It’s time to check out the new IRoam Eboard Segway which seems to be a pretty cool model. At least by the looks of it, we’ll see how well it does during our extensive testing. So for starters the shipping was extremely fast, took us 2 days to have it delivered to our office. Packaged nice and it comes with a few extra things: A carry case and a remote key lock. We haven’t tested many eboards with remote key lockers yet but it seems like a useless feature, but in a cool way it wasn’t. At least not when testing the thing, we rode it for a bit and just like when you leave your car you lock it down with the press of a button. What we and probably everyone else finds attractive with this eboard is its fine design. Everything fits together perfectly. From the cool black rims with silver details on them to the red pressure mat which is very comfortable to ride on without shoes for you who use it indoors this is a great plus. Some hoverboards have very distinct markings in their pressure mats making them very uncomfortable to ride without shoes, but not the IRoam hoverboard it is very comfortable to ride barefoot on. Another thing that instantly caught my eye and made me fall in love with it was the dark blue led lights, one might think this wouldn’t give much of light while riding whilst it’s dark. But it really does light up the ground just fine and it is goes so well together with the rest of the eboard Segway with its black and red colors. Well it doesn’t have too many fancy features but it has some. Most likely that’s why the price tag on the IRoam self-balancing skateboard is so much cheaper than on many other devices. A ride on the IRoam hoverboard was just as I had imagined it: COOL! Might not be as price worthy as the coolreall which you can read about here, but still the music feature makes up for the price tag. That’s how we felt anyway, it can go as fast as 7 mph Don’t be scared of this! It’s just to say you’re going over the recommended speed limit which is 6 mph. I got really scared when this happened due to me not reading the manual beforehand. We clocked it at 9.64 mph with our gear, but somehow it felt a lot faster. It went on for about 10 miles just as advertised and it cleared the uphill test with ease. Charging time was good too, although I was a bit lazy leaving it on for 2 and a half hour without watching it… (This rarely happens to me, most often I can deliver to you the recharge time on the second). Unfortunately I missed out on that but it recharges within the stated time of 1-2 hour without a problem. A smooth and fun ride which made the time just fly by. And you can just stare at it while its charging because it’s design is so pristine.